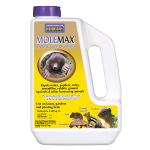 Effectively rids lawns, gardens and plantings of Moles, Voles, Skunks, Rabbits, Ground Squirrels and other burrowing animals. Bat Magic drives bats from attics, blinds, wall voids, chimneys, and other confined spaces they like to hide. 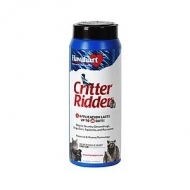 Eliminates the annoying odors, squeaking, rustling, scratching and the risks of rabies and histoplasmosis that come with bats in your residence. Mole and vole repellent granules and bulb protector. 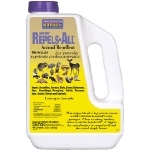 Repel moles, voles, gophers, rabbits, armadillos, and skunks in lawns, flowerbeds, gardens. Clean, dustless, biodegradable granules are safe for use around children, plants and pets. 1 lb. treats 500 sqft and lasts up to 3 months. Contains Rucinus Communis Oil Caster Oil 10%. 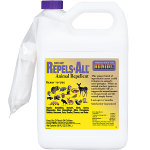 The most comprehensive animal repellent on the market just became the most economical as well. Quart concentrate makes two gallons and lasts two months. Rain fast in six hours. Satisfaction guaranteed or your money back. Not for sale in FL, IN, and KY.
All natural ingredients. 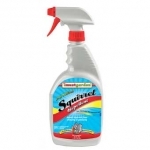 Protects plants and property including structures from a wide variety of nuisance pests. Lasts up to 2 months. No mixing! Just attach the hose and apply. Repels by touch, taste and smell. Will not harm animals. 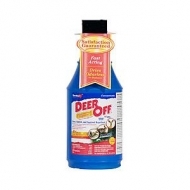 Stops damage by deer, rabbits, squirrels, beaver, ground hogs, skunks, moles, voles, raccoons, rats and birds. Lasts at least two months. Safe for use around children and pets. All natural ingredients. 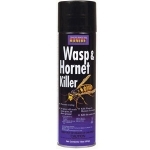 A potent blend of all natural and USDA recommended ingredients-clove oil, cedar oil, cinnamon oil, and sulfur combine to effectively repel snakes from yards, gardens, sheds, campsites, patios, decks---anywhere they are undesirable. Snake Stopper does not harm snakes; it simply drives them away naturally. Safe for use where children and pets play. Not for sale in IN and KY. Application Lasts Up to 30 Days! Repels by Odor and Taste. Patented formula contains Oil of Black Pepper, Piperine, Capsaicin. Proven Canadian Technology. Safe to use indoors and outdoors. Not a urine-based product that may attract other predators. 1 Application Lasts Up to 30 Days! Repels by Odor and Taste. Patented formula contains Oil of Black Pepper, Piperine, Capsaicin. Proven Canadian Technology. Safe to use indoors and outdoors. Not a urine-based product that may attract other predators. 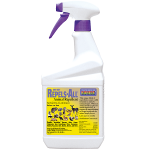 Animal repellent that repels skunks, dogs, cats, groundhogs and raccoons. Pateneted Canadian Technology. Granular application is an ideal multi-surface barrier. One application lasts up to 30 days. Repels by odor and taste. 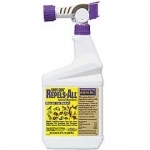 A natural repellent for use on fruits, vegetables and ornamentals. Even stops animals from chewing wood structures and fences. One application can last up to 4 weeks. Made from hot cayenne peppers. I Must Garden Squirrel Repellent is used to protect against the destructive chewing by squirrels. Use it to protect buds, flowers, leaves, bulbs, garden furniture, flowerpots and more. Contains a blend of castor, cedar, clove and lemongrass oils and white pepper. Safe for people, pets and the environment. 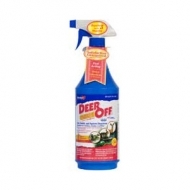 Spray directly on surfaces to be protected. Reapply as needed. 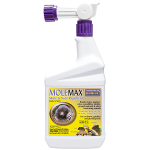 Not for Sale in LA and MS.
Molemax Mole repellent ready to spray. 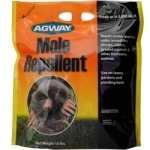 Repels moles, voles, rabbits, skunks, and other burrowing animals. One qt. Treats 10,000 sq. Ft. And lasts for 30 days. Not for sale in KY and IN. 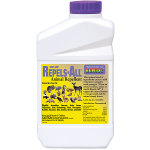 The product is a dry granular mixture which is simple to apply by lightly sprinkling bands around homes, cabins, trailers, tents, pools, etc., to keep those areas snake free. 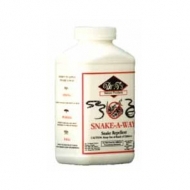 Snake-A-Way has a time release mechanism of action that allows it to remain potent and effective for 2 months in all types of weather. Drive moles from your yard using two new scientific methods of activity. A special time release encapsulated aroma and an unusual go-getum taste that makes moles go wild after the first physical encounter.